With the passing away of our first beagle, Bonnie, just after New Year’s Day 2002, Bootsie, the younger male beagle, became downright depressed. He languished on the sofa. He malingered on my bed. He followed me around. It became woefully clear that “we” had to find a replacement for Bonnie. Not a replacement, really, because I would have vetoed the idea. Some dogs cannot be replaced; other dogs ought not be replaced. This pup would have to fill her own shoes. We looked in the local newspaper for weeks, going into months. We -- two children and two parents -- journeyed to several locations in search of the magical pup. There was one expedition that I found so disgusting and traumatic (puppy mill) that I banned any further searching. I’d just have to comfort Bootsie a bit more during the day and hope that he did not feel too alone during the night at the foot of our bed. By April, spring had sprung and Bootsie was not leaving the sofa or my bed without prompting. If you have ever seen a sad hound dog, the vision of Bootsie exceeded it in both sadness and houndiness. On the morning of a rainy April the fourth, Dear Husband called me from work. He’d found an advertisement in the newspaper for a Bench Beagle. Now what precisely that type of beagle was, I did not know, but we would soon find out! These puppies were six weeks old, which is on the young side for a pup to leave the mother. Each was tiny in size but huge in terms of being too adorable for words. The males had been quickly reserved for purchase. The more expensive remaining pups had been placed into a makeshift fenced area, the $1000-ring. The hound husband had placed the three “less-expensive-but-available” tiny pups on the grass. One female pup was terrorizing the runt of the litter. As expected and predicted by Dear Daughter, her mom went straight to the runt and picked it up. Just so it would feel loved!! The runt was nicknamed “Marie Antoinette” because her companion sister, the alpha female, kept trying to bite her head off, chewing it off at the neck. This alpha female caught the eye of Dear Husband. He pointed her out to me. The attentive hound husband then swooped in and picked up Alpha Female Pup. He set her into the $1000-ring. Moments later, after this pup started terrorizing those potential show dogs, the even more attentive hound husband picked up Alpha Female Pup and set her back into the group of less-expensive-but-available pups for sale. Marie Antoinette looked alternately happy and afraid. Dear Husband picked up the Alpha Female Pup. I checked her for the soft pleading eyes; sufficient black markings on the saddle; proper proportion of the body length to the height of the legs; a nice “flag” (the tip of the tail has to be white); a gracefully domed head; square muzzle that will not turn snipey; and the length of the ears. The ears in particular were impressive. Dumbo came to mind. Yes, her snout still has a pink spot on top. I had already decided on the name, Bridget Louise, and so this handful of a puppy somehow fulfilled my pre-conceived idea of what a Bridget would be: little, spirited, spunky. But not smelly! On the way home, I held this soft, loudly-snorting puppy in my lap, and the odor of her puppy breath was so strong that I firmly asked Dear Husband to pull the car over to the side of the road so that I could leave the stench and get a breath of fresh air! I’d even asked if we’d driven over a skunk! As time passed, Bootsie did keep up with the little firecracker! As a matter of fact, at first, Bridget could not keep up with him! She cried so fiercely when they raced around one grassy hill that I’d call Dear Husband to go outside and find out if Bridget was severely injured! And Bootsie immediately became Her Hero. This adorable little puppy immediately garnered the center of attention and all kinds of praise. A teaching colleague declared, “She is the most beautiful puppy I’ve ever seen!” When I notified him that Bridget had grown a lot in the three weeks since he’d last seen her, he declared she was still as small as a cucumber! Bridget immediately posed for pictures, not on a bench but on sofas and beds where she began to nudge out Bootsie for her share of flannel quilt and down blanket space. This elder male hound was about 3 inches taller and had more of a foxhound-build. He was not intimated by her size but, as one neighbor said, “This one has attitude.” Her attitude was noticed! 10. In the dog bed. On 24 February 2015, Bridget Louise, our Duchess, turns 13 years of age. She has come a long way from being as small as a cucumber. She no longer has puppy breath but she still snorts very loudly, especially for a bite of your food, and groans through her treasured sinuses while resting. She has not ever entered a show ring. She does not perch on a “bench” to be judged for her conformation. She does, however, pose for the approach of the food bowl. And while she is waiting to come back into the house, she positions herself proudly, big puppy paws firmly planted – on the leather sandal of her Master. While standing on the shoe of her Master, she does very well filling her own shoes! The rule with Bridget is one taste of everything that I eat, after I get my first bite. She prefers the idea of 5-6 small meals a day during a reducing regime! But she cheerfully adjusts to my varying schedule and, at times, unpredictable routine. Here is an area where she is willing to work with me. Being part of the “pack” is what’s important! Regarding her preferred foods, we first became aware of Bridget’s love of the Chicken very soon after she came home to Bootsie. Quite unlike her registered owner (April 2013 Essay), Bridget was fiendish to devour The Chicken. I’d thrown a few chicken breasts (with some rosemary sprigs on top) into the oven (in a baking dish, of course). This tiny pup clambered to crawl inside the 350-degree oven. Dear Husband pulled her away from door of the hot surface. Bridget raced right back to the closed door of the oven, determined that she could get into the compartment and devour the aromas along with the poultry! This pattern continued several times until we put Bridget outside until dinnertime. Perhaps the most important and rewarding element of her life (even more fulfilling than sniffing the floor for food; even more thrilling than being fed a drop of human food, a process that has been likened to feeding a seal) is The Walk with The Master! Dear Husband is like a fox being hounded while he dresses for The Walk. The tracking and trapping begins when The Master is behind the closed door of the bathroom, brushing his teeth. Bridget does not move a muscle until the twist of the doorknob sounds! Her focus then seizes upon any movement toward the front door. 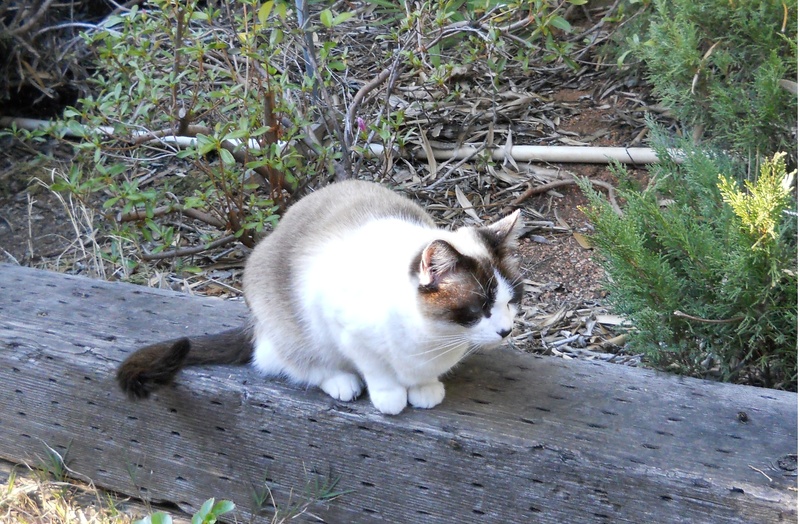 Once outside, she jumps, placing her front paws onto the real bench by the garage. With almost quivering excitement, she waits for the Tyrolean-woven walking harness to be slipped onto her body, in the same way that a fine lady waits for her exquisite black evening coat to be slipped over her shoulders before she enters the limousine on the way to the opera. During the occasions when I “go for a walk” and Bridget comes along with The Master, the Baby Love thinks the event is taking place just for her! On the days when I practice singing, my first few notes form the signal for Bridget to go outside and use her instrument (bark). When she has completed her vocal exercises, she comes back into the house for a while. By then, I have progressed from scales to a warm-up song. Those first few notes sound the alarm for her to go into my bathroom and paw through my small wastebasket for Q-tips. I then have to retrieve her and place the wastebasket onto the tile ledge of the bathtub. I could empty the wastebasket ahead of time, but it would deprive her of her quarry. And, yes, it is sad that such a highly prized lineage has been reduced to hunting Q-tips and the occasional tissue (which she rips to shreds and then consumes). And I must mention her knuckles. Bridget has what I call "knuckles" or leg joints above her big puppy paws. They form part of the tenseness of her physique! I explain to onlookers, “She’s all knuckled up,” whenever she’s very tensely excited or expects some food about to drop down her way! One of her more show-doggy movements occurs when she coils up to quickly spring up, off the floor! And then she lands in the center of her dog bed. It is an amazing feat to observe. She is so pleased with herself afterward; I always praise her! I even wrote an ode in her honour, #14, in the poetry volume, Solstice. Over the last few years Bridget has done very well without Her Hero. She is a heroine all on her own! And the fact that she is a cousin of Uno and a more distant relation of Miss P only adds to her heroic stature!